1. Are you available for emergency services on holidays? Yes, Archer Services is a 24-hour, 365 day-a-year emergency service company. Call us anytime! 2. Will my insurance cover your bill? In the vast majority of cases, our bill is paid by the insurance company. For specifics, review your policy. 3. I had a water damage occur in my house. Why can’t I just let it dry on its own? Doing nothing when water damage occurs can be disastrous. Mold, mildew and overall damage to structural integrity can occur. In addition, a homeowner that delays in getting water damage taken care of can be denied a claim if they decide to repair the problem at a later time because often insurance companies will consider this owner neglect. It is best to take care of the problem immediately to avoid further complications. 4. How long does your drying equipment need to stay in my house? On average, it takes three to five full days for a structure to dry with the proper equipment. Insurance company protocol calls for a minimum of three days for equipment to be on site. Although the affected area may seem dry, there is often hidden moisture that needs to be resolved. 5. I just have a minor drywall damage that needs to be repaired. Do you do small jobs? Archer Services does all kind of jobs, from small repairs to major restorations. 6. My house is completely dried out, but there are damaged areas. Now what? Archer Services is a full restoration company; we can see you through the whole repair process. We are the restoration experts! 7. Your website mentions “direct insurance billing”. What is that? Archer services uses the same pricing software as the major insurance companies. Therefore, we are able to deal with the adjuster directly, creating less of a burden on the homeowner. 8. I live in rural Georgia, in the country. Do you provide services here? Yes. 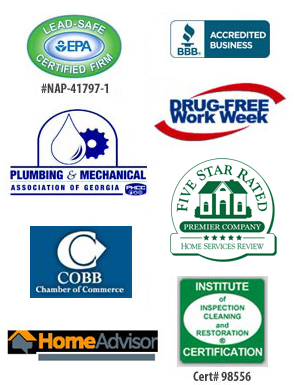 We service the following areas; Dekalb, Gwinnett, Paulding, Bartow, Cobb, Fulton, Cherokee, Coweta, Forsyth, Dade, Dawson, Douglas, Fannin, Fayette, Gilmer, Hall, Lumpkin, Murray, Pickens, Walker, Whitfield, Carroll, Clayton. 9. What causes water damage? Water damage can occur for a variety of reasons. Flooding, burst pipes, roof leaks, overflowing septic tanks, leaks in the plumbing system and malfunctioning household appliances, such as refrigerators or hot water heaters, are common causes of water damage that we see on a regular basis. 10. How quickly can mold growth occur? Mold spores from excessive moisture after water damage can cause mold spores to start growing within 48-72 hours. The rate of growth can vary based on moisture level, temperature, etc. As long as the issue is dealt with promptly and completely, mold will not be an issue. 11. Is mold dangerous? Yes. Molds can cause serious health problems, especially with people who already have sensitivities to it. Molds can trigger strong toxins or irritants that can worsen allergies and cause asthma attacks. Three of the most dangerous and commonly found indoor toxic molds are stachybotrys (black mold), asperigillus and penicillium. 12. I recently bought an older home. We took out a wall, and then we found asbestos. Now I need to have it removed. Do you remove asbestos? Yes, we do. We are certified to remove asbestos safely from your home. Asbestos has harmful chemicals in it that can be hazardous to your lungs, and you don’t want them in the air. Asbestos has been linked to Lung Cancer and death. If you aren’t sure where the asbestos is in your home, let us test it for you. We can also safely remove it so that no one is harmed and your home is restored. >>>If you have a question that is not listed here, email us using our contact form or give us a call!